Let me guess: you are here to learn how to get rid of moles fast and for good! Well, lucky you, we’ve got you covered! The further discussion will help you find better and more effective ways for controlling moles that seem to take residence in your garden. 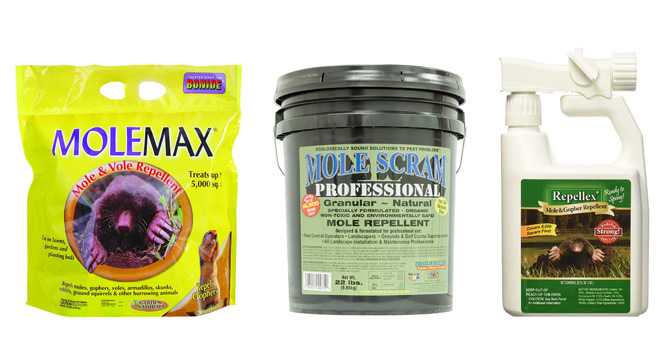 We’ll recommend the Best 8 Products to get your mole problem under control! I moved out of the big city a while ago. And while I really appreciated the extra breeze and enjoyed living close to the wildlife, my suburban experience was not without its drawbacks. One of these was dealing with nuisance critters that took up residence in my garden without any intention to leave whatsoever. I found myself at the crossroads: I passionately loved animals, but I also adored gardening. My neat raised beds of herbs and perfect paths of my otherwise manicured lawn were ultimately destroyed by the moles. Thanks to my background in biology and passion for scientific research, I was able to deal with the critters in a timely and thorough fashion. In this guide, I will help you find better ways to drive the unwanted animals away from your property. Read on to join me on this mole adventure. How to identify moles in your garden? Mole control methods: what does science say? First, I want to cover mole biology basics, so you know what you are dealing with. Moles are not to be mistaken for rodents, these are entirely different creatures. Moles are small mammals that mostly feed on invertebrates, namely insects, worms, and grubs. Unfortunately, since the moles spend most of their time underground, they are not fully studied and thus, entirely understood. However, don’t be discouraged by such a revelation, there are still quite a few things that we know that can help us in dealing with this nuisance wildlife. Because moles mostly feed on invertebrates, they don’t have the teeth big enough to feed on plants thus, the damage that they cause to vegetation is purely incidental. They might, however, grab a few of those beautiful leaves of your favorite flowers and snug them inside their burrows, but they won’t eat them, instead, they’ll use these leaves as their sleeping beds. How cute is that? Moles have large pads with long claws that help them swim through the soil and build elaborate and sophisticated tunnels underground. Contrary to popular belief, moles do have eyes, they are just so small and covered with fur, that at first sight, you might think that the creatures are totally blind. Moles have a well-developed sense of touch, smell and taste. They will quickly detect unnecessary airflow and unwanted metallic or plastic objects inside their burrows. Whenever they see their regular tunnels damaged or destroyed, they will go through anything to repair and seal it up. This knowledge will help you in identifying regular mole tunnels for putting baits, traps, or repellents inside. All you have to do is pinch a hole inside a relatively straight tunnel and wait 24 hours to come back and check for any repairs. If the hole is sealed shut, then moles are actively using this tunnel and this is the exact place where you’d want to put your toxic baits or traps. However, if you see that the hole is still there, then you will have to continue looking for regular tunnels elsewhere in your garden. Moles are solitary creatures thus, they live by themselves most of the time. If you think your garden has moles, then you’re probably dealing with one to three creatures at most. Regular trapping will take care of those in no time. The mole habitat is irrigated and fertilized lawns with plenty of moisture and worms. They prefer sites with loam and sandy soils, rather than dry, coarse, or clay. Moles are very easy to identify. If you see surface tunnels meandering through your garden, then these are probably the work of moles. However, moles can be easily mistaken for gophers, and vice versa. But it’s important to differentiate between the two since what works in eliminating gophers can deem entirely useless and ineffective in dealing with moles. What is the difference between moles and Pocket Gophers? Differences between moles and pocket gophers. Minute eyes are often not visible. Small eyes are clearly visible. Muzzle is long and tapering. Muzzle is rounded. The many small teeth are not apparent. Orange, chisel-like pairs of upper and lower incisors are apparent. Mounds are round when viewed from above. Mounds are crescent- or heart-shaped when viewed from above. Soil plug is in the middle of mound and may not be distinct. Soil plug is in the middle of the V shape or off to the side of the mound and may leave a visible depression. Tunnels are often just beneath the surface, leaving a raised ridge. No tunnels are visible from above ground. I go by a very simple rule: if you see just a handful of cone-shaped mounds of coarse soil and earth clods, then you have moles. If you notice a huge number of the fan or kidney-shaped mounds of finely sifted soil with burrows usually plugged or sealed, then you have gophers. This rule never failed me, so should work fine for you too. Moles are actually very helpful and have their own important role in the environment: they aerate the soil and help reduce pest problems by eating various insects and grubs. However, digging is the problem: tunneling gets in the way of perfectly groomed lawns and disturbs the root system of young plants and delicate herbs, causing them to die. Pack the soil with a lawn (or garden) roller: this will make it harder for moles to “swim” through the packed soil, causing them to move elsewhere inside your garden where they don’t do much damage or outside to the neighboring property. Thus, the mole problem will no longer be yours, but your neighbor’s. How smart is that? Eliminate moles’ primary food source by applying insecticides to kill worms, grubs, and billbugs. This strategy can either play out well or not: moles can simply enhance their digging in search of more food hence, increasing the damage. If the above strategies failed to work, then move on to the next sections to explore your options. 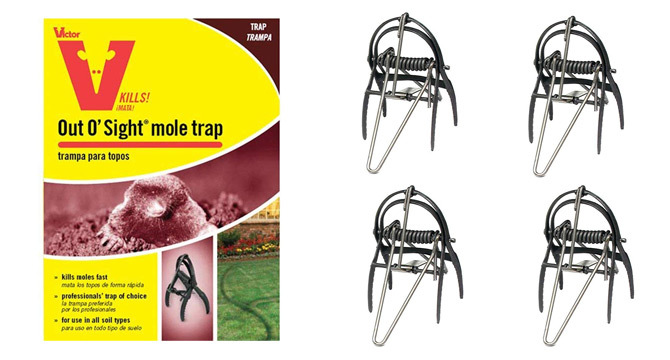 Mole traps are usually coming in three types: scissor-jawed, harpoon, and choker type. The scissor-jawed is confirmed to be the most effective mole trap that proved its efficacy in various field trials. One of the best representatives of the classic scissor-jawed traps is Victor Out O’Sight Mole Trap. The only drawback with these types of traps is that you really have to put an effort into learning how to set them properly so they would work. If this information has not been enough, then proceed reading the detailed instructions in the material specifically dedicated to mole traps: 5 Best Mole Traps. 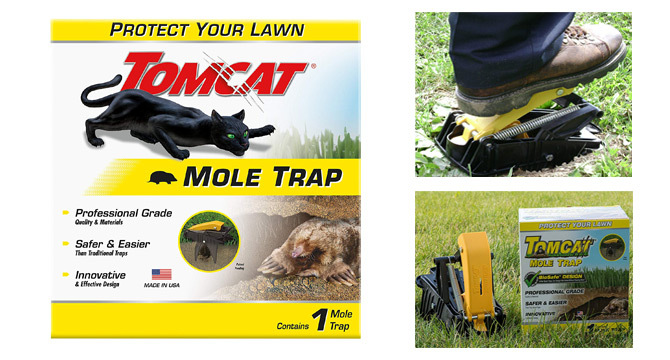 If you think the digging up is not something you would like to do and get your hands dirty, then Tomcat Mole Trap might be an answer for you. It’s very easy and intuitive to set: locate a regular tunnel, make a small indentation with the heel of your shoe, use the depth gauge (that comes with the trap) to ensure the tunnel is just right and set the trap by stomping on it with your feet. Easy! 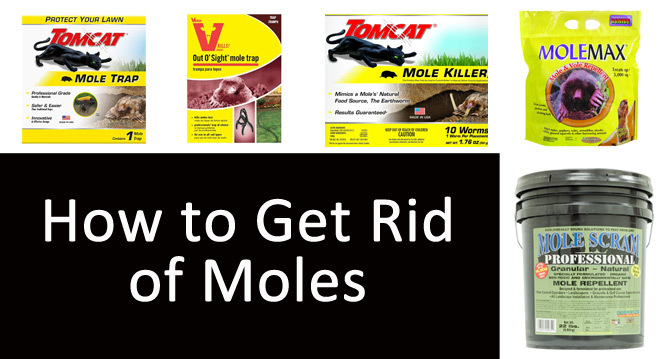 While mole poison is not the best solution, sometimes it can be the only option left, especially if you think you have a large mole infestation. Unfortunately, though, there’s still little research available on the cost-effectiveness of mole poison, and scientists do not recommend resorting to it unless you’ve tried other options with no success. The other issues that you have to consider before choosing this method are legal. Some states classify moles as nongame animals and protect them under conservation efforts. Here, you will have to obtain a special permit to kill moles on your property. Some other states, like North Carolina, made killing moles illegal. Here, the only options you are left with are mole repellents. Other states do not classify moles at all, giving you complete freedom in choosing the control method. Please, check with your state’s department of wildlife to see what options you have. However, if all is well, and you’re free to choose, then go for the poison that’s shaped like a worm, a primary mole’s food source. 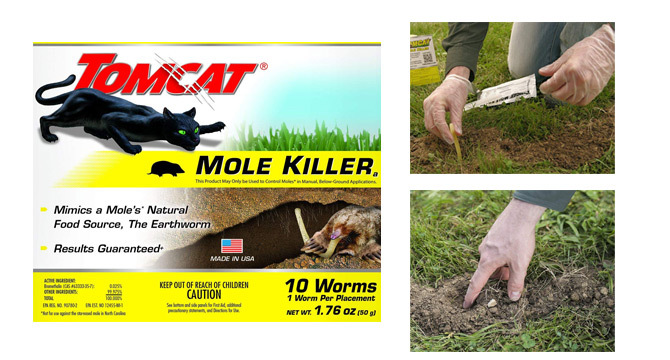 The perfect example of this type of toxic bait is poison worm from Tomcat Mole Killer. If your love for animals is just as big as mine, then you’ll probably resort to mole repellents. And I’m here with you. I shared my own story of using one of the ultrasonic repellents here. Repellents work by sound, taste, or smell aversion. Those that work by sound are ultrasonic electronic devices, and those that work by taste or smell are usually natural ready-made products. Ultrasonic devices emit ultrasound frequency waves that make moles flee from the area treated with ultrasound. The sound is safe for human and pets (maybe less so for dogs). Unfortunately, the effectiveness of such devices is questionable but many consumers comment on their effectiveness, nonetheless. One of the examples of such repellents is Wonniteck Solar Mole Repeller. 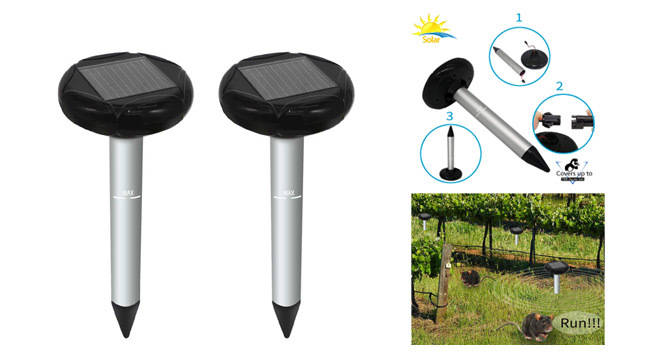 Usually, these devices are solar powered, waterproof and very easy to use. Just plug the device into the soil and leave until you moles are gone. The natural repellents work by taste and smell aversion and mainly consist of the following ingredients: garlic, citronella, eucalyptus, mint, and castor oils, with castor oil being the main active ingredient. There’s also little research available on the effectiveness of natural repellents. However, a few studies that exist confirm that castor oil can be, in fact, used as a preventative and substantive measure. If you choose to try this method, then you might look into buying either repelling granules, like Bonide Mole Max or Mole Scram, that have to be spread around the garden, or liquid repellents, like the one from Repellex, that have to be mixed with water and sprayed around the garden using water hose. Gas bombs are not readily fit into any of the above-mentioned categories, with some classifying them as repellents, while others prefer to put them into poison category. There’s certainly some truth into this ambivalent definition: the chemical blend that’s produced by the smoke bombs asphyxiate the mole by depriving it of oxygen and making it flee. 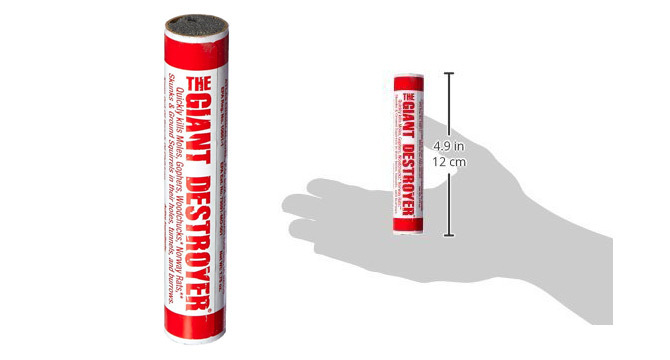 One of these bombs is the Giant Destroyer with active ingredients such as sodium nitrate (50%), sulfur (38%), and charcoal (9%). When ignited gas bombs produce highly toxic compounds: carbon monoxide and carbon dioxide, nitrogen and sulfur oxides. Gas bombs are also illegal in some states, so check before buying. Also, the effectiveness of gas bombs can be questionable: mole tunnels are elaborate and the soil can be too porous for gas to be effective. Reliable if set properly, which takes time and effort. Worm-shaped toxic baits are rather effective. Usually water-resistant, waterproof, work on solar batteries. have to be used consistently for effective results. How to get rid of moles in yard with juicy fruit gum? First, this is not a good idea. The belief goes as though by eating a bubble gum, the moles’ intestines will plug up. Well, surprise, moles do not chew on bubble gum, no matter how juicy or fruity it is. There are various natural repellents available that you can use: from natural granules to organic sprays. You can also plant mole repellent plants, namely caper spurge and the castor bean. How to get rid of moles in lawn / in garden? Same as you would anywhere else: traps, repellents, poison. Try the garden or lawn roller first to pack up the soil and make it less habitable for moles. Other than that, basic control measures apply. How to get rid of moles and voles? Mole poison usually works on all species, including voles. Also, try repellents that specify that they work on both moles and voles. How to get rid of moles in yard with castor oil? There are ready-made products available that you can use. I mentioned some of those products above. However, if you’d like to learn more, please, read our article on Best Mole Repellents. How to get rid of moles in the garden humanely? The most humane way is to drive the moles away with repellents. Any repellent will do. Science also has a definition for humane killing, which implies killing an animal as fast as possible without causing unnecessary suffering. Mole traps (while not tested for humaneness) usually kill moles instantly. However, if a mole is trapped by a limb, it will inevitably die a slow and agonizing death. How to get rid of moles and gophers? It’s crucial to differentiate between the two species, since what works for moles might not work for gophers, and vice versa. For example, mole traps will not work for gophers. And poison peanuts that are good for gophers will not work for moles. How to get rid of moles in yard with home remedy? Here’s one of the recipes I shared in another article on Mole Repellents: mix 1/4 cup castor oil, 2-3 tablespoons of unscented dish detergent and 1 tablespoon of cayenne pepper. Pour into the mixture 1 gallon of water. Blend everything. Now pour the solution in the sprayer and spray around the garden, or dump it whenever you see a mole activity. How to get rid of moles safe for dogs? I would not use ultrasonic repellents and any toxic baits containing zinc phosphide, as the latter is extremely dangerous and can kill your pet. How to get rid of moles in the winter? Moles do not hibernate during winter. They hide in their nests underground but they are still active. Getting rid of moles in winter can be truly challenging since they would be hard to catch especially if you have mounds of snow outside in your yard. I would suggest using ultrasonic repellents as the primary measure. If you don’t have a lot of snow, then use trapping as well. How to get rid of moles in NC? It’s illegal to use fumigants, poison, and traps against moles in NC, especially star-nosed moles. The options you have left are repellents. How to get rid of moles in Washington state? You can use repellents and poison. All body-trapping mechanisms are illegal in Washington after the passage of initiative 713 in 2000. How to get rid of moles in flower bed? You may resort to using poison that’s not absorbed by the soil. Zinc phosphide cannot be directly incorporated into the soil. There’s no silver bullet in getting rid of moles. Whatever option you choose, always follow the instructions provided by the manufacturer to increase your success chances. If you’re in the market for humane ways of dealing with moles, then go for repellents, not a single mole would be killed. If you’d rather see and touch the blood with your own hands, go for trapping. If you prefer moles die somewhere else underneath your lawn, go for poison. If you’re one of those experimenters, go for gas bombs. And use several methods at once if a few descriptions from above suit your type! © 2019 All Rights Reserved, getting-rid-of-ground-moles.com is a participant in the Amazon Services LLC Associates Program, an affiliate advertising program designed to provide a means for sites to earn advertising fees by advertising and linking to amazon.com and affiliated sites.